Miss. 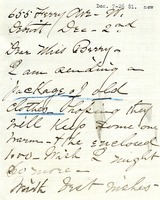 Roby writes Martha Berry, enclosing a package of old clothes in hopes that they will keep someone warm. She also encloses $1000.